A combined force of police officers and UPDF soldiers on Thursday shot a notorious criminal and recovered an AK47 Rifle Reg No UG UPDF UH2268-2000 recently stolen from Kaladima prison in Amuru district. The operation followed a tip off by residents of Lacor Trading Center in Gulu Municipality where the suspected thug was reportedly terrorizing them over a period of one week. According to Aswa River Region police spokesperson, Jimmy Patrick Okema, the suspect was shot during the operation that took place at 9:00pm. He however escaped with bullet wounds but was arrested Friday morning at Cereleno in Layibi division, Gulu town. “He was shot at and wounded but managed to escape. We recovered gun No UG- UPDF- UH 2268-2000 with 9 rounds of ammunition. We later arrested him at around 11am from a timber store in Cereleno on intelligence from the residents, ” Okema said. Police identified the suspect as Patrick Opiro,28, a resident of Ogom village, Pangora parish Anaka Sub county in Nwoya district, an ex convict of Luzira prison. “Opiro was a formally released from Amuru prison on 23rd March 2018 of charges of aggravated robbery and murder having served 14yrs in different government prisons, like Masindi, Gulu and Amuru. He was a former convict of Luzira prison” he noted. The gun recovered was recently robbed at panga point from a warden Charles Aleku at Amuru prison, Kaladima. 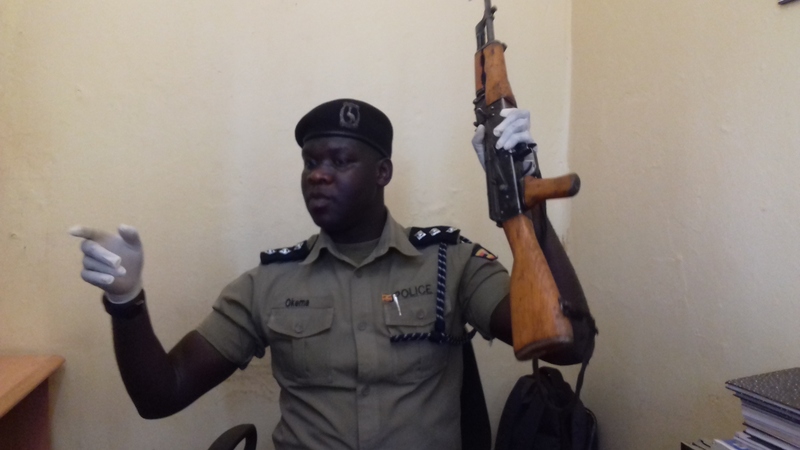 The police spokesman said Opira who lost a lot of blood from the wound is receiving treatment at Gulu Regional Referral hospital pending preferable charges of illegal possession of government fire arms.